Yeager Asphalt chose an ALmix plant that offered them room to grow, supporting between 100,000 and 120,000 tons per year at maximum capacity. If you walk up to Yeager Asphalt’s paving crew for a chat, you might be talking to the company’s CEO without even knowing it. Even after 40 years, 70 employees, and the addition of an asphalt plant, CEO Mark Yeager still runs the Leeboy 8515 paver on most of the company’s jobs in and around Carrollton Township, Michigan. After all, it’s where he got his start. Yeager grew up familiar with the asphalt industry. He began sealcoating driveways the summer before his senior year of high school with nothing more than a pickup truck and a 55-gallon barrel of sealer in 1978. By the following year, he’d starting offering asphalt paving, first by hand, then with a Layton pull paver the following year, and then with a used Leeboy paver he bought in 1981. These early years were a time of industriousness and investment. Mark Yeager, left, runs the more technical side of the business, while Brad Lewinski, right, runs the “more political side” of the business, Lewinski said. During the Michigan winters, Yeager would head to Clearwater, Florida, and sealcoat there. He continued to live with his parents and save every penny to reinvest in his business. It was a strategy that paid off. “By the mid-80s, I was starting to make really good money and I’d wanted to buy a Lamborghini,” Yeager said, but he instead invested the money in a sealer plant. Year after year, he continued to invest in the future of Yeager Asphalt while quietly laboring alongside the paving crew. At Yeager Asphalt, just as the CEO can run the paver, a mechanic can become vice president. In 2002, Lewinski started working for Yeager Asphalt as a mechanic after answering an ad in the local paper. Now, he’s the vice president of the company and a partial owner in the new asphalt plant. That strategy worked. Three years later, the company added another sales person, promoting Nick McGuire from within. Then, six years ago, John Manti, had come into Yeager’s office to sell them something and left with a job. And two years ago, they hired George Menard. 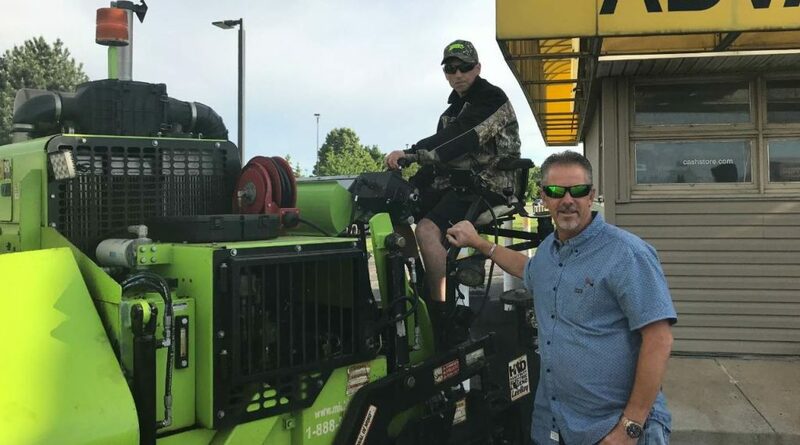 In the span of two decades, gross revenue expanded from $2 million to $13 million, Lewinski had transitioned from mechanic to vice president, and Yeager could cut back on his own sales activities and return to what he loved most: riding alongside his crew atop an asphalt paver. 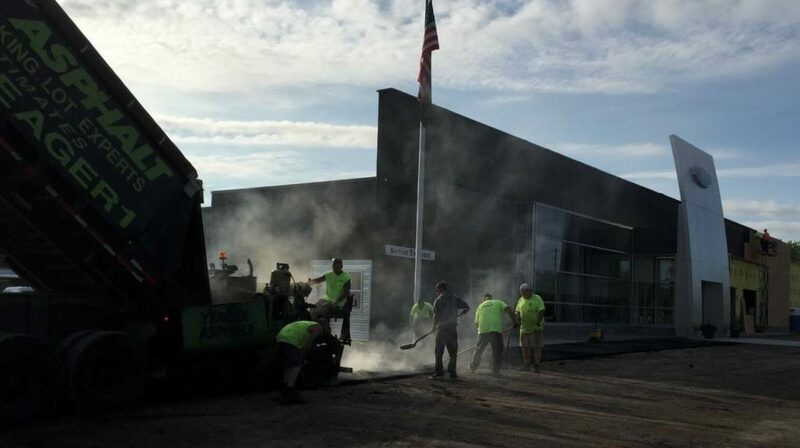 Today, Yeager Asphalt has four sealer crews, one striping crew, a patching crew, two prep crews and one paving crew. Most of its work is paving and maintaining parking lots, but they also continue to pave and maintain private roads and driveways. Applying these principles, Lewinski said, also often turns some of the worst jobs into the company’s best advertisements. For example, on one job, the crew put on too much crack sealer on one of the hottest summer days on record. Doing right by its customers and community was also integral to Yeager Asphalt’s expansion into asphalt production. Yeager and Lewinski had wanted to buy an asphalt plant since before the 2008 economic recession. But, just as it wasn’t the right time for Yeager to buy a Lamborghini in the mid-80s, it wasn’t the time to invest in an asphalt plant. Branding is also important to the company. Its black and lime green equipment has become well-known in the area. So they bought the best sealer equipment available and got ready to weather the storm. It turned out there were other factors that made it wise to wait for the right time to invest in an asphalt plant. For twenty years, Yeager had his eye on the perfect property for an asphalt plant. The 50-acre parcel of land was only a couple blocks from the Yeager Asphalt office and right across the street from Yeager’s sealer plant. It was close to the expressway, which made it convenient for customers and expanded its operating distance. And, it was located on the Saginaw River so aggregates could be shipped by boat rather than trucked in. However, 20 years ago, the title on the property stated that there could be no stone piles on the property. Plus, the asking price was too high and the land was contaminated. But, over time, each of those negatives turned out to be in Yeager’s favor. “Other people had wanted to buy that property in the past, but that clause about stone piles kept them from buying it,” Yeager said. He kept an eye on the property and when the termination date of that clause came up, Yeager quickly purchased the property. Additionally, the parcel’s status as a contaminated property also turned out to be a benefit to the company during the permitting process in that they qualified for tax exemptions for having purchased contaminated grounds and creating jobs. However, that’s no longer the case. Instead, prior to any of the assembly, U.S. Paving and Stone hired an environmental company to do a phase one and phase two analysis of the grounds to determine their level of contamination. Then, U.S. Paving and Stone just had to ensure that they would contain the contamination and not contribute to any further contamination. 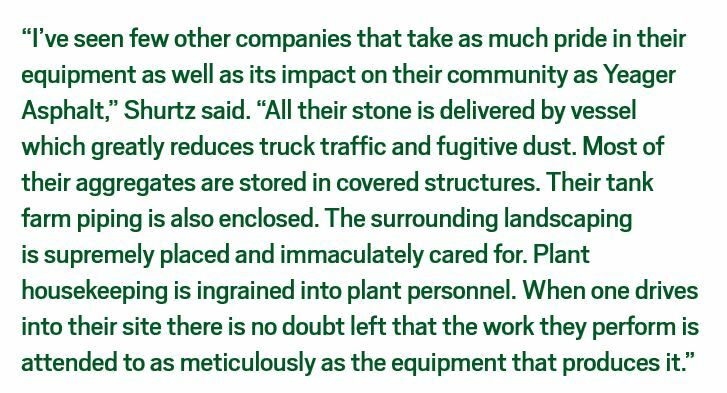 When they first began the permitting process for the asphalt plant, Lewinski recalls the sentiment among the community. “There was a lot of distrust because other companies in the area had made promises that never came to fruition,” he said. But, he took the time to get to know the planning commission and answer questions from the community during and after meetings. Although some skepticism remained, the plant was approved and U.S. Paving and Stone kept its word. The company spent around $200,000 beautifying the property. Although the community grew to support the plant eventually, the permitting process still wasn’t easy. “It was two years before we could put a shovel to the ground,” Lewinski said. They had to resolve issues with soil erosion, air permits and the property’s location on a floodplain. By the end of it all, Lewinski knew everyone in the DEQ office on a first-name basis. Since the property has an international dock–it’s located along the Saginaw River less than 20 miles from Lake Huron–they also had to work with Homeland Security and the U.S. Coast Guard. But, the process paid off. Now they can receive aggregates by commercial vessel rather than by trucking the material in, which Yeager said is a huge cost savings. “Already the value of the plant is four or five times what it cost us because of all the things we had to go through to get it up and running,” Yeager said, adding that they’ve already been contacted by companies wanting to buy them out. In fact, U.S. Paving and Stone is already looking to expand south of Saginaw County. Yeager Asphalt has four sealer crews, one striping crew, a patching crew, two prep crews and one paving crew. When the time came, U.S. Paving and Stone purchased a brand new ALmix plant with a maximum capacity of 200 tons per hour. Those bells and whistles meant not skimping on cold feed, RAP and RAS bins. The company has six cold feed bins, two RAP bins, and one RAS bin, with a screen associated with each bin rather than one screen for virgin materials and one for RAP. “This allows sizing the screen cloth to the aggregate in the particular bin,” Shurtz said. “This is particularly important in the thinner lifts often associated with private work.” Additionally, all-weather hoods protect the RAP/RAS bins such that mix design percentages are not limited by sudden rainfall. For example, even though U.S. Paving and Stone doesn’t run warm mix through the plant, they do inject their mix with water via a static blender prior to entering the mixing drum–like they would a warm mix–but they run it at hot mix temperatures. They also do all of their own crushing and screening of RAP on demand. Going the extra mile on their mix design is vital for U.S. Paving and Stone. “A lot of companies were buying from big conglomerates and they were happy with their material,” Lewinski said. To compete, U.S. Paving and Stone hired an award-winning engineer to create their mix designs. The amount of RAP the company uses in its mix depends on the job. For Michigan DOT jobs, the cap is set to 20 percent. On private work, they usually run 15 to 20 percent RAP, Yeager said. Another thing that sets them apart from the competition are their relationships. Lewinski’s son, Trevor, is the plant operator. He started working at the company at the age of 16 and rose through the ranks of the sealer division before becoming U.S. Paving and Stone’s plant operator. Now, that’s not an issue–for Yeager’s crews and the crews of U.S. Paving and Stone’s customers. In fact, Lewinski recalls, some companies in the area tried to discourage them from making such a large purchase. But, with good timing and hard work, that leap of faith was the right call. In 2016, U.S. Paving and Stone manufactured around 40,000 tons of asphalt and last year, they manufactured 65,000 tons. According to Lewinski, the plant has never lost money. “It’s been profitable since day one.” And, with the ALmix plant they chose, they also have room to grow. The plant could support between 100,000 and 120,000 tons per year at maximum capacity. 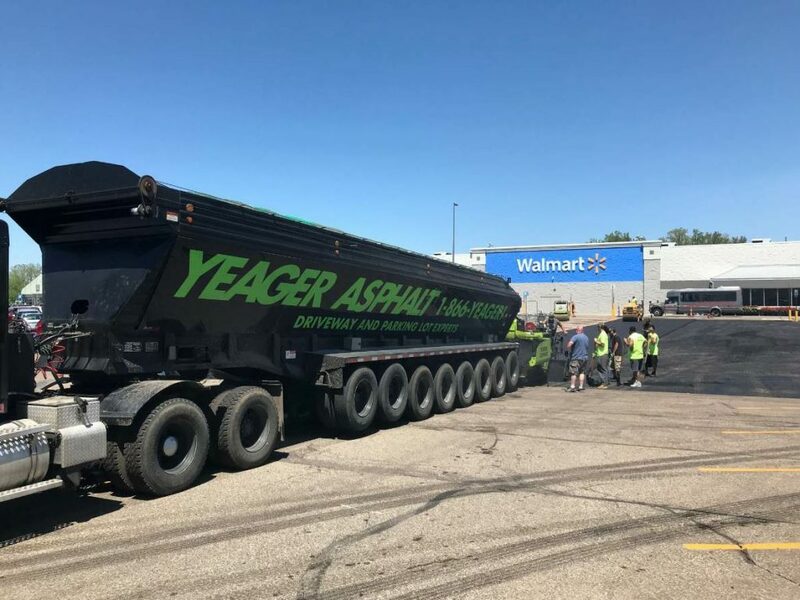 Despite its growth, Yeager Asphalt and U.S. Paving and Stone continue to be family businesses. 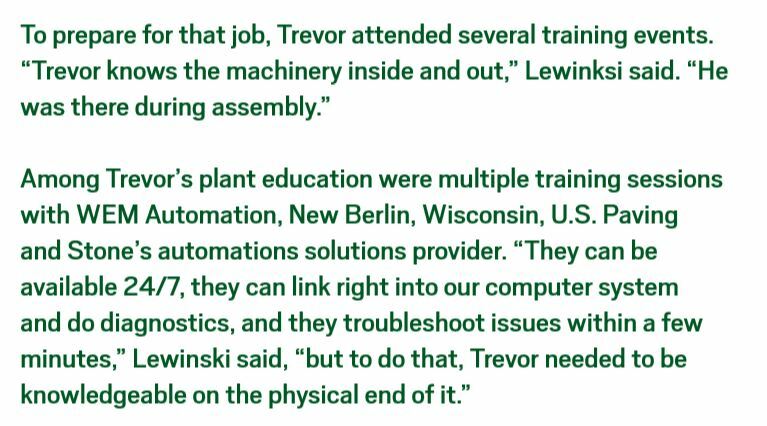 In addition to Trevor Lewinski running the plant, Brad Lewinski’s wife, Sherry, is the office manager and Yeager’s wife, Shannon, is the company’s CFO. When asked what’s next for the company, Lewinski said it’s difficult to say.